Many people look at the glamorous lives of movie stars and wish that they, too, could have that life. I think that's nuts. I can't imagine how horrible it would be to live your life in a fishbowl, your every move scrutinized and reported on in the press. I want to live my life in peace and not be a featured tabloid headline when I go to the grocery store in sweatpants sans makeup. That being said, I do think it would be cool to make a movie. I just wouldn't want to be a star. I wouldn't want to carry the responsibility of making a multimillion dollar gamble pay off. I wouldn't want the attention. What I would want is to be the weird character actor that you see for 30 seconds onscreen. That would be fun. I could be an awesome bag lady, the nasal complaining neighbor, a bored salesclerk, or the belligerent shopper. It would be fun to put on makeup, play pretend, see the inner workings of movie-making (fairly boring, so I've heard), and then go back to real life and still be able to shop in my sweatpants. So if either of my loyal readers are casting directors who are looking to fill slots for Curious Bystander #2 or Complaining Restaurant Patron, give me a call. I have an amazing repertoire of annoying voices and weird faces I can do. I don't have any headshots to send you, but I've got lots of food pictures. Does that count? Today's cake is a good example of make-believe. Doesn't it look glamorous? 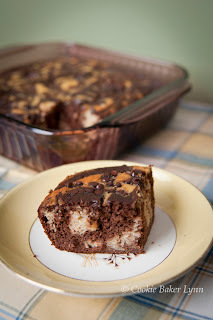 All moist and marbly, with delicious chocolate chips sinking into it? You would think that the recipe came from a big name cookbook, possibly one associated with a bakery in New York or LA. And you couldn't imagine that this beautiful baked good could be made without grains or refined sugar, could you? Surprise, it's both! Yes, as deceptively gorgeous as a Hollywood celeb on the red carpet, this cake is actually something that fits our current, weird dietary needs. Imagine how happy it makes my family to have cake and eat it, too! And it's full of good ingredients, so I'm happy to bake and serve it. 1- Preheat oven to 325 deg. F. Grease an 8x8-inch pan. 2- In the bowl of a food processor, combine the beans, eggs, stevia, vanilla extract, and honey. Process till smooth. 3- Add the coconut oil, salt, baking soda, and baking powder. Process till smooth. 4- Pour half of the batter into a medium bowl. (I eyeballed the halfway point on the side of the food processor bowl and marked it with my finger.) Set it aside. 5- Add the cocoa powder to the batter in the food processor bowl. Process till smooth. Pour the cocoa batter into the prepared pan. 6- Sprinkle the coconut flour over the batter in the bowl. Whisk to combine thoroughly. Pour the batter over the cocoa batter in the pan. 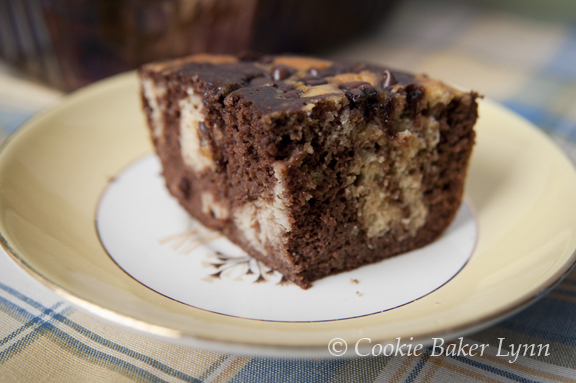 Gently drag a table knife through the batter, swirling to create the marbled effect. Don't overdo, or you'll lose the pretty swirl effect. Sprinkle the top with the mini chips. 7- Bake for about 32 minutes, till a cake tester inserted in the middle comes out clean. Beans!!! Yes this is a beautiful "pretend" star! Please if you get that cast call, let me come along and be your foil. Sure wouldn't want to be the star but a bit part and then shop in sweat pants, I'm with you. White beans?! Is this one of those secret healthy-delicious cakes that the movie stars eat then? Yum! I am amazed at this - no flour and no sugar. Do you think agave syrup would work as well as the stevia? Fab idea to use the beans and coconut flour. Looks better than most of the stars on the red carpet! I will be making this just out of blatant fascination. Plus, I'm off grains (boo) and LOVE cake. I just love it. I dream of it. This is on the docket for this weekend! Oh, and I agree with Grace. I want someone to do my hair everyday. Because I know there is good hair, there, somewhere. I just lack the skillz to let it OUT! I'll take the fortune without the fame, though I've always wanted to be on Conan O'Brien :) (Been watching him since he started). That cake looks fantastic. How's the texture compared to a standard cake? 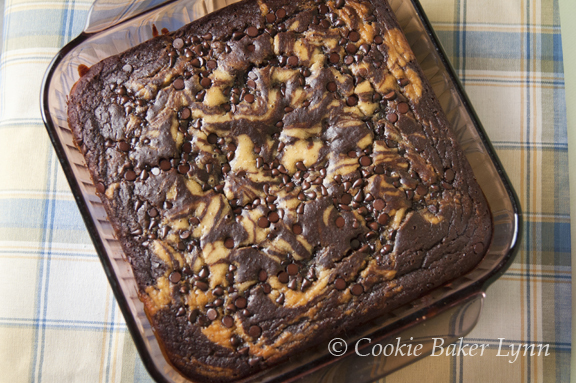 I've found that brownies made with beans can have an unusual texture. Granted it's never stopped me from eating the heck out of 'em :).